I have a friend who is an amazing mom. Her daughter has more resilience than most kids, and my friend attributes some of it to experiencing her parents’ divorce at a relatively young age. But the resilience this 7-year-old has developed doesn’t just come from adversity. It comes from adversity combined with nurturing—from her mom’s constant kindness, patience, and gentleness. It comes from unconditional love. When we talk about “grit,” we often forget the role of kindness and compassion. The omission is especially troubling because grit is usually discussed in relation to African-American and Latino students in high-poverty schools. It folds into a larger pattern: the assumption that children of color from low-income families need a firmer hand than the children of middle-class white parents. They should be instilled with a doctrine of “no excuses.” Their teachers should be tougher, louder, and meaner. This mentality feeds into a disturbing pattern of racial profiling that results in a fundamentally racist treatment of children of color. African-American boys in particular are deemed by some educators to be somehow less deserving of gentleness and patience when they misbehave. Consider the following snapshot: 15 minutes in the lives of two African-American children. This happened in a school in my town a few weeks back. Twenty kindergartners were being noisy at lunch. A little girl (who is white) jabbed a little boy (who is black) with her finger and they started joking back and forth. Meanwhile, the only other African-American boy in the class, full of pent-up energy after a morning spent sitting still and quietly for long stretches at a time, stood up for a few seconds. Within minutes, both African-American boys were sent to a table facing the wall, where they ate their lunch in isolation. Plenty of white students, acting in equally wiggly ways, received no consequence of any kind. Both these boys are sweet kids. They are funny and kind. One of them, whom I’ll call Joshua, is the best reader in the class. When a parent volunteer went over to ask Joshua if he was doing OK, he said, "I want to go home. I just feel sad when I get moved over here." Of course he does. It is humiliating to be removed from every other child in the lunchroom, sent to sit alone facing a blank wall. This child is 5-years-old. Kindergarten is hard no matter what. But for thousands of African-American boys across the country, it’s a lot harder than it needs to be. These micro-humiliations are perpetrated in schools every day by adults who would be shocked if you accused them of racism. There's a secondary problem beyond the hurt and embarrassment these two boys felt. Every child in the cafeteria, of all races, got the message that African-American boys behave badly—even though the consequence was disproportionate to any minimal misbehavior that actually took place. Racial profiling doesn’t begin when young black men begin driving and are pulled over by police officers for minor or fabricated reasons. It doesn’t even begin with disciplinary measures in high school. It begins with young black boys’ first experiences in school. For a disturbing read, take a look at this piece in The Huffington Post published in late September: Yes, Preschool Teachers Really Do Treat Black and White Children Totally Differently. It refers to the fact that African-American students are 3.6 times more likely to be expelled from preschool than white students. It also points to a study that may explain why: Teachers monitor African-American students more closely for misbehavior and, when told that a student has a difficult home life, feel empathy to that child only when the teacher and student are of the same race. So what do we—white teachers in particular—do about this race-based tendency toward “tough love,” absent the love? I’m still figuring it out, but here are a few thoughts. 1. Know yourself. Then educate yourself. Few teachers are racist on purpose. We have to check our own biases, and that can’t happen if we don’t admit to them. The same thing is true of bias. We all have it. But we have to do what we can to root it out. That begins with an attempt to understand experiences, perspectives, and beliefs that are foreign to us. In college, I decided to major in African and African-American studies. I took those classes because I suddenly realized, at age 18, that I didn’t know a single thing about the contributions of African-Americans to my country. In those classes, I learned about plenty of new content—new cultures, languages, works of art and music. But it went beyond that. When I took African history, I learned new ways of conceiving of history itself. In the Ethiopian notion of “sweet history,” enjoying the telling is more important than dates and accurate records. When I took courses in African art, I began to see the concept of art itself differently. Making art could be more important than hanging it on a wall. A verbal proverb could be implied in a visual symbol in art forms like Akan goldweights. My concept of music changed, and of language: Not just the things I saw, but the way I saw them. 2. Get to know more people of color. It’s hard for white teachers to get beyond our own perspective, because we live in a society where 21st century segregation exists in schools, neighborhoods, and churches. This isolation has real consequences for how we relate to African-American children and parents. I learned as much in college from my black classmates as I did from my professors. They told stories that revealed a fundamentally different society than the one I grew up in. One of those classmates was run off the highway by a racist trucker while crossing Ohio. Another, who grew up in Little Rock, Ark., was put in the lowest reading group at the beginning of each school year, with all the other kids who had the darkest skin. Throughout the year, she would gradually be moved up through the groups as the teacher realized what a strong reader she was, just to be placed back in the lowest and darkest group again the following year. A few weeks ago, I started a series of Saturday playdates in a park near my children’s school, so that families can get to know one another beyond nodding and saying hello at pickup time. We had a mix of African-American, white, and international parents. For the last hour of the playdate, I held a baby in my arms, the younger brother of an African-American student in my son’s class. Looking down at his round face and calm eyes gazing up at the tree branches overhead, it struck me as incomprehensible that this child would grow up with a much greater chance of being shot by police than a white child would. 3. Know and love our students—all of them. Teachers play an outsized role in children’s lives. During the week, we spend more waking hours with our students than their own parents do. We send our students messages every day, by our words and actions, about who they are and who they can become. We need to check ourselves when we keep reprimanding the African-American or Latino boys more than the other students in the class. We need to ask whether the books we pick for read alouds, the guest speakers we invite to our classrooms, and our teaching methods themselves reflect the identities and experiences of the children in our care. When we witness something like what happened in that lunchroom to two 5-year-old boys who didn’t deserve the punishment they received, we need to speak up. It’s uncomfortable. It’s hard. But so is being a kindergartner who is treated harshly because of the color of his skin. Before we get tough on our students of color, let’s make sure that we know them and love them. Let’s be certain that they feel that love every day. Justin Minkel teaches 2nd and 3rd grade at Jones Elementary in Springdale, Ark., a high-performing, high-poverty school where 85 percent of the students are English-language learners. 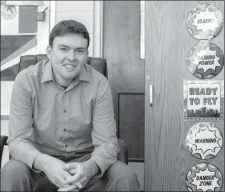 A former Teach For America corps member, Minkel is the 2007 Arkansas Teacher of the Year and a member of the National Network of State Teachers of the Year. In his instruction, he is focused on bringing advanced learning opportunities to immigrant and at-risk students. Follow him at @JustinMinkel.